I KNOW that Star Wars Rebels is new show. I know that they’re still building their 3D asset library. But I feel compelled to point out that the little security sensor in Agent Kallus’ office is the same 3D model as the Imperial Claymore. 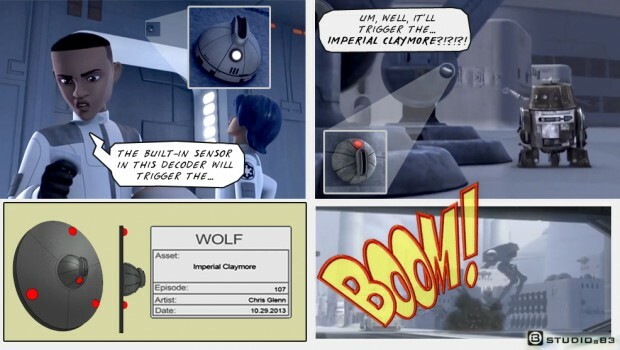 It seems to have been inspired by the Thermal Detonator that Princess Leia used in Return of the Jedi. It makes me wonder what would have happened if Ezra would have walked out that door. Would there have been an explosion? Next story A Christmas Card for you!